C&R Kuttbottle, a local nonprofit organization that collects glass bottles to recycle and repurpose, recently partnered with students from Stephen F. Austin State University's School of Social Work. The students worked to secure grant funding for the organization. 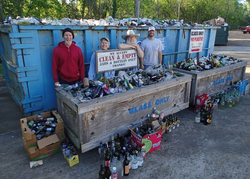 Pictured are volunteers, from left, Stan Bobo, Marilyn Richardson, Steve Chism and Justin Banchs-McRae at C&R Kuttbottle's glass recycling bins, located behind the Judy B. McDonald Public Library. NACOGDOCHES, Texas - Students from the Stephen F. Austin State University School of Social Work worked to secure grants for C&R Kuttbottle Inc., a nonprofit organization based in Nacogdoches that recycles and repurposes glass, the only East Texas organization to do so. For their seminar in advanced rural practice course, the students wrote a grant proposal that sought funds for the organization. Dr. Jose Carbajal, assistant professor of social work, instructed students to identify a need within the nonprofit and write a full grant proposal designed to address it. Throughout the semester, students met with the founders to assess their funding needs. All the students researched potential grant applications for the organization. Carbajal chose C&R Kuttbottle because it's locally based, which made it easier for the students to frequently interact with the organization's leaders. "I wanted the students to have this experience so they were not intimidated by the process of searching for and submitting a grant application," Carbajal said. "In addition, I wanted them to learn the importance of community practice and to address a societal need." This course also provided an opportunity for students to work with a real organization in order to gain practical experience with grant writing. Sabrina Guerrero, an SFA social work student, said, "The grant process was very real to all of us, and the reality of the difference it could make for C&R Kuttbottle motivated us even more." C&R Kuttbottle's goal is to promote environmental sustainability awareness and encourage more community involvement in recycling. During the semester, the organization's purpose fueled the students' passion for the cause. "If this grant is successful, I am hoping it will help spread awareness of the work C&R Kuttbottle does in Nacogdoches," Guerrero said. "We want to inspire others to get involved in whatever way they can and help this necessary cause." Carbajal is proud of the work his students accomplished for the foundation, and he believes each student gained practical experience with grant writing. "Grant writing is a technical, concise, persuasive writing skill. Foundations use this writing style to assess whether a grant proposal application satisfies its mission." To learn more about the work of SFA School of Social Work students, visit www.sfasu.edu/socialwork.